Collagen is the most common protein in the human body, comprising about 30 percent of the body's total protein content, according to Medical News Today. Collagen offers a wide variety of skin benefits, but the benefits vary depending upon environmental factors and how your body accesses collagen. Some products make extreme claims about their benefits, and applying collagen directly to the skin is unlikely to yield many benefits. Many products contain collagen, but not all collagen-based products confer benefits. Injectable collagen can help boost skin elasticity and thickness, but the long-term effects vary depending upon the product you use. Collagen creams can't penetrate the deepest layers of the skin, so the effects are minimal. A 2013 study published in the journal "Skin Pharmacology and Physiology," however, found that oral collagen supplements may help boost skin elasticity. Collagen helps your skin maintain its elasticity. This prevents your face from developing wrinkles every time you make an expression and accounts for the youthful appearance of younger skin. 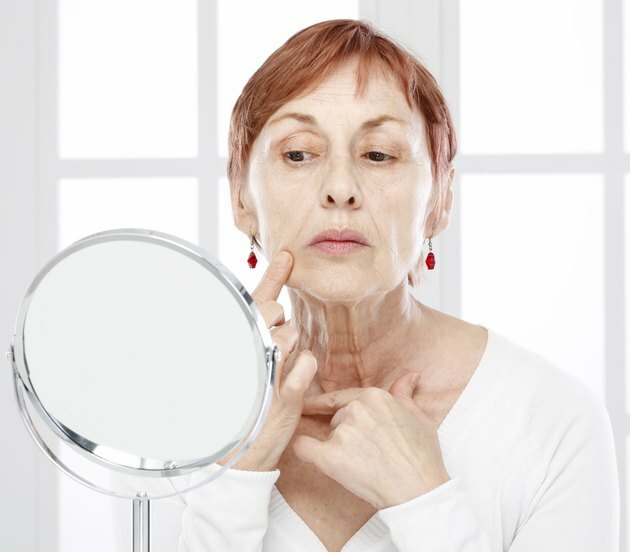 As you age, collagen tends to break down, and this reduces skin's elasticity, resulting in wrinkles, saggy skin, age spots and similar effects of aging. When collagen breaks down, the expressions you've made throughout your life begin to show in your face. Exposure to sun can compound the effects, resulting in fine lines, wrinkles and sagging. Collagen injections won't prevent future wrinkles, but collagen is a popular wrinkle filler with effects that can last for months. Treatment is not permanent and will have to be repeated if you want to maintain your results. Collagen can also be used as a filler for scars, particularly those caused by acne. As you age and collagen breaks down, your skin can scar more easily -- and the scars may be deeper and more pronounced. Injecting collagen into the scars can help minimize or even eliminate their appearance. As with wrinkle-fighting collagen injections, though, the results only last for a few months. Medical News Today: What Is Collagen? What Are the Benefits of a Collagen Powder Drink? How Effective Is Vitamin E for Acne Scars? Can Exercise Tighten Sagging Neck Muscles and Skin?